The Tail of Hanuman was part of many important incidents in the Ramayana like the burning of Lanka. Legend has it that the power in the Tail of Hanuman is that of Goddess Parvati. When Shiva decided to take an avatar in the form of Hanuman, Goddess Parvati was worried she will become lonely. Shiva then convinced her that Hanuman will only be a partial Avatar (Amsha Avatar) and he will be present in Kailash with her. When Shiva took the form of Hanuman, Goddess Parvati was so impressed that she wanted to be part of the Avatar. Parvati then decided to become the tail of Hanuman. This is the reason why the tail of Hanuman is so beautiful and imbued with Shakti – the power of Mother Goddess. 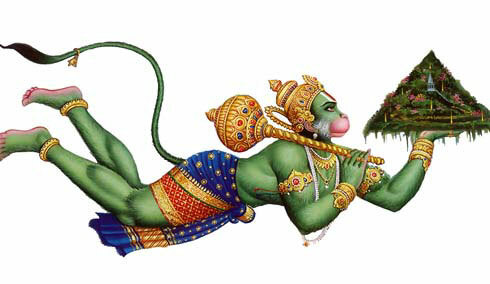 The tail was used by Hanuman to burn Lanka and play numerous tricks on the demons. It had the power to elongate and grow thick and thin. The tail is so powerful that Bhima, the second of Pandava brothers, found it impossible to move.